This 19-year-old male presents with left knee pain. 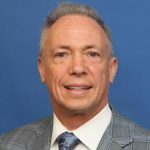 The patient had an anterior cruciate ligament (ACL) repair three years prior. Q1 – What is a common pitfall when diagnosing meniscal tears of the posterior horn of the lateral meniscus? 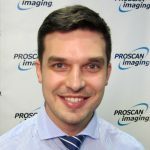 Q2 – How can a Wrisberg rip be diagnosed with confidence? Q3 – What major injury is associated with a Wrisberg rip? Q4 – Vertical posterior sliver tears adjacent to the capsule of the medial meniscus are associated with which major injury? As hinted, this case is that of a Wrisberg rip. A Wrisberg rip can be difficult to accurately diagnose. 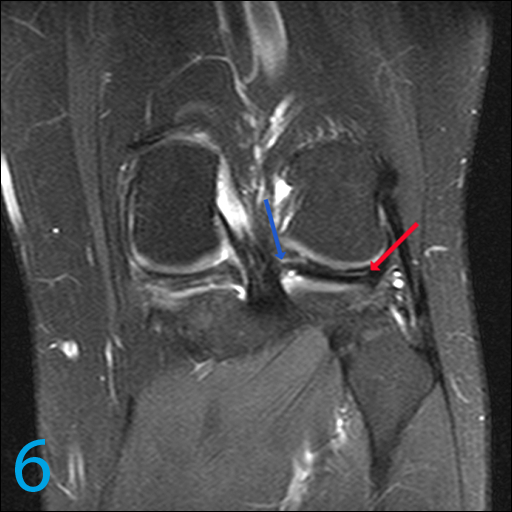 There is normally a cleft between the Wrisberg ligament (images 7 and 8, yellow arrows) as it attaches to the posterior horn of the lateral meniscus (images 7 and 8, pink arrows), and this cleft of high signal can be misdiagnosed as a tear. However, when abnormally high signal extends beyond the posterior root, and into the posterior horn towards the body, a pathological tear can be diagnosed with confidence. In this case, the coronal images clearly demonstrate lateral extension of high signal towards the lateral posterior horn / body junction over a length of 2 to 3cm (image 6, blue and red arrows). It can also be traced with its oblique orientation from anterosuperior to posteroinferior on the sagittal images (images 1 – 5, green arrows) along its mediolateral length, confirming the pathological nature of this finding. A Wrisberg rip is associated with anterior cruciate ligament rupture. 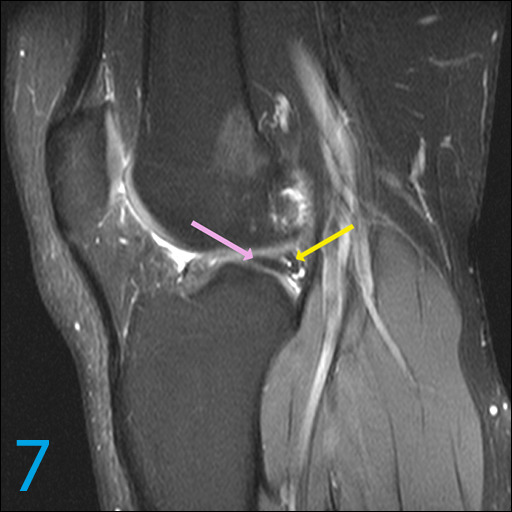 In this case, the patient has a ruptured anterior cruciate ligament graft (image 9, orange arrow). 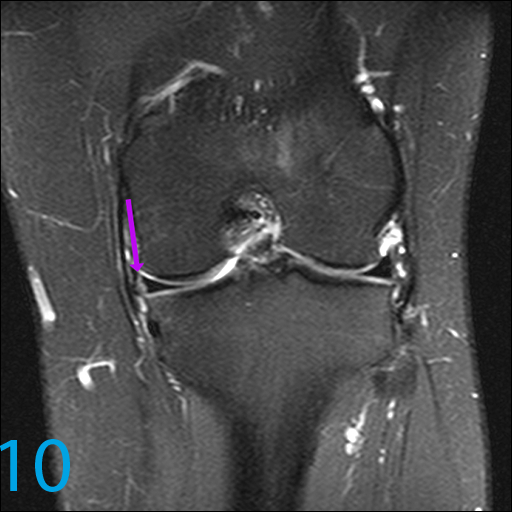 Also associated with anterior cruciate ligament rupture, is a vertical sliver (“linear”) tear, or peripheral rim tear, adjacent to the posterior and medial capsule (image 10, purple arrow; image 11, green arrow) of the body and posterior horn of the medial meniscus. 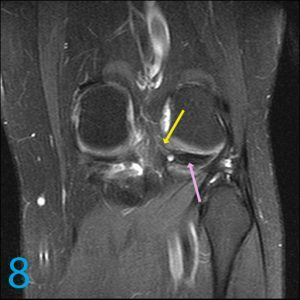 Whether these meniscal injuries occurred with the initial anterior cruciate ligament rupture, or subsequent rupture of the graft, is indeterminate. However, a chronic time frame is favored. You can often tell if these tears are new by their higher signal, and more intense swelling around them. 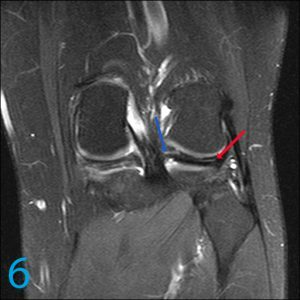 A1 – Attachment of the Wrisberg ligament onto the posterior horn of the lateral meniscus can produce a high signal cleft that can be misdiagnosed as a tear, but is actually a normal variant. It’s typical course is anterosuperior to posteroinferior. A2 – When abnormal signal is seen to track from the posterior root through the posterior horn and towards the body. In other words, the normal Wrisberg reflection is only seen on one or two sagittal slices. 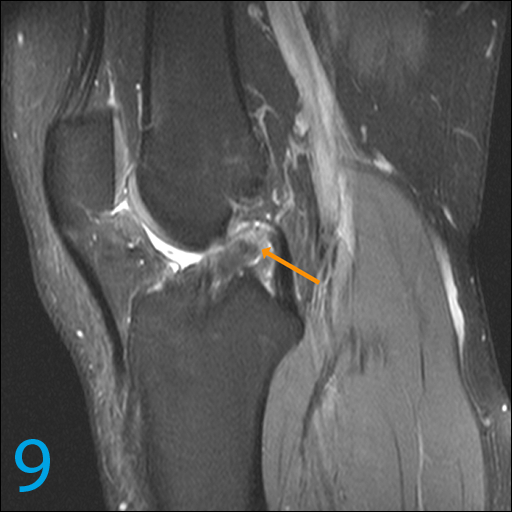 A3 – Anterior cruciate ligament rupture. A4 – Anterior cruciate ligament rupture. 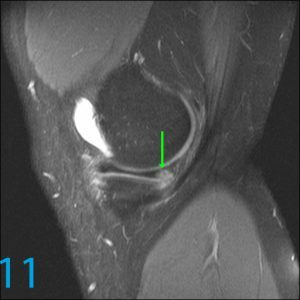 Check out MRI Online for more case review. There is pain and swelling, but where is the source?